I love fruit! A good, ripe nectarine or some cold watermelon can instantly improve a hot summer day (or even a cold winter day, assuming such fruits were available then). Lately, Jeff has been bringing home lots of strawberries in big containers, even though I’m the only one in the family who eats them regularly. After giving them several washings that would pass any OCD pesticide-phobic overly finicky person’s requirements (not that I’m any of those things) I cut up the ones I haven’t eaten yet and stash them in the refrigerator for the next several hours that might pass before I eat the rest of them. As impossible as this is for me to comprehend, when I open the fridge door looking for a snack and see them sitting there chilled, washed and ready to devour, they actually look better to me than ice cream, even the kind of ice cream with huge globs of fudge embedded into it. Not to mention, the strawberries are much prettier than ice cream. Or maybe I just like red? What fruits do you most enjoy eating? I hereby grant you permission to go out and buy yourself some, even if they aren’t on sale. Just be sure to wash them VERY WELL before diving in! Those look scrumptious! Back home, my strawberries are probably at their peak, since there were more blossoms this year than I’d seen in years. My favorites though, are raspberries. I always kid that I’ll know I’m in heaven because the raspberries won’t have seeds (having achieved perfection)! I will take you up on that fruit buying invitation! Maybe I’ll even look for a strawberry pot. They don’t require much washing when you grow your own, and the best is when one side is still warm from the sun, and the other side still cool from the shade! Hmmm, I wonder if I could grow my own strawberries? It might eliminate some of the pesticide phobia. On the other hand, considering what happened to my tomatoes, I’d probably only be feeding the squirrels! Let me know if you locate a seed-free raspberry this side of paradise. I LOVE raspberry sherbet but usually buy raspberries only when I’m making fruit salad. Maybe I should try eating them as a snack sometime. Raynard, applesauce does count and now that you mention it, do you make applesauce cake? I have known a few people who had recipes for it. I need to start making my own fruit smoothies. I will be watching for the photos of your red white and blue patriotic cake (with a little chocolate thrown in for those of us who are chocoholics!) – have a great weekend! As much as I enjoy strawberries, I’m an ice cream with gobs of fudge gal! How about ice cream with gobs of strawberries? Bob, you left out pineapples! Seriously, it’s good to enjoy healthy sweets. I was told that cantaloupes and honeydew are great for diabetes, and also heard that berries of all kinds are (surprisingly) better on the blood sugar levels than, say, orange juice. But surely it’s all better than refined pastries and cookies. At least that’s what I tell myself when I pig out on watermelon! Someone told me tomatoes are a fruit, but I refuse to move them from the vegetable list because there are so few of those that I like! I still remember the first time I had fresh pineapple that someone had brought from Hawaii. Canned pineapple was ruined for me! It is still probably the sweetest, most delectable thing I have ever eaten. Rene, I had the same experience long before we moved to Hawaii. I remember thinking that canned pineapple wasn’t even like the same fruit in comparison. While we lived in Hawaii, we kept fresh pineapple in the fridge all the time. We could get them for about a dollar each, including the coring and slicing, so there was really no work or mess involved, and WHAT A TASTE! We buy it whole, not canned, at the grocery store now, but the quality varies a good bit and it’s hard to get one at the perfect degree of ripeness. Sadly, most of the pineapple farming left Hawaii long ago, priced out by the relative expense of everything there compared to other sources. Beautiful strawberries! I love these berries and they have been so good. I would eat as many as possible, when in California. I did my shopping this morning and you can guess what went in to my cart. I craved them while I was pg with Jennifer. Our fresh peaches are coming in now and that was what always tasted so good while I was on chemo . Hope you all have a great week end. Hugs and love to all. Carolyn, as a Georgia native, peaches were my first love among fruits (except maybe for watermelon) and I still love them. Mama used to put them up in the freezer and I loved to get out a carton and eat the whole thing. I just washed another carton of strawberries and as soon as I finish these comments I’ll go put them in the fridge! YUMMY! Hope you have a wonderful weekend. Love and prayers to you and Terry. I love blueberries and STRAWBERRIES for breakfast, with a multi grain english muffin or multi grain waffle. 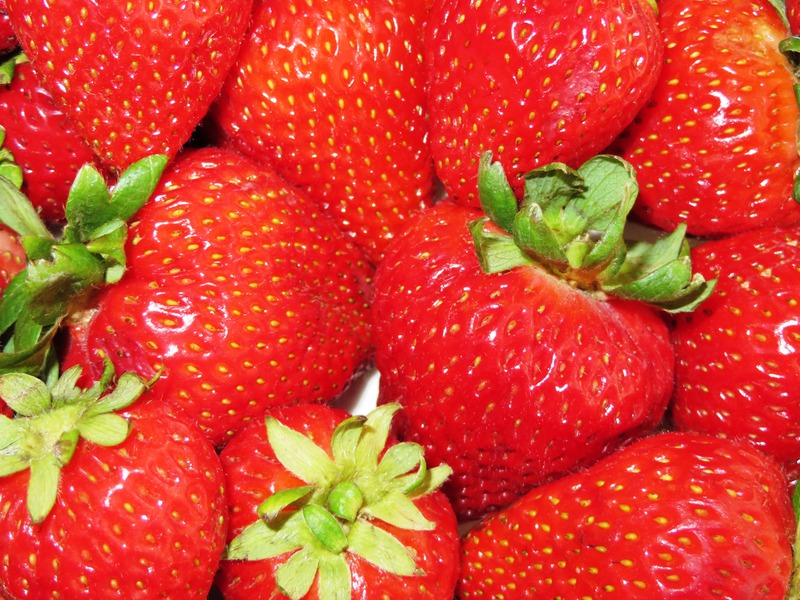 Although those juicy red strawberries may be preffered to ice cream; they do look pretty good-ON ICE CREAM. Just a treat-in moderation, of course. I too love Strawberries, closely followed by raspberries. We’re growing both, though sadly the ants have raided the strawberries this year. I picked up a container of organic strawberries at our farmer’s market last week, and my entire family gathered around and devoured them. Delicious! Gorgeous photo, Julia, and I love that quote! Thanks Alys, I’m happy you liked it! Wow, home-grown strawberries and raspberries. Can I come to your house for a snack? 😀 ANTS! I never thought about them. I would fear the squirrels and birds more. Do you grow strawberries in a strawberry pot? What about raspberries? Believe it or not, I have never seen raspberries growing, though we once had a small strawberry garden when I was a child. Hope you and your family are having a great Father’s Day today! Hello, Julia. I like fruits and I ‘m glad applesauce counts; I eat it on my toast in the mornings. I do have to be careful of too much acid. Watermelon is my favorite. I also like strawberries dipped in chocolate! Merry, I should try applesauce on toast. My Granny used to make apple butter which I loved (to me it’s like a brown, spicy version of applesauce) but I never thought of using applesauce instead. I LOVE watermelon and literally can eat half a melon in one sitting, which is what I used to do until I found out how much sugar/calories are in them! Neither Jeff nor Matt eat watermelon so I get stuck eating the whole thing (tough job, but someone has to do it) and I can’t afford to do that very often because of all the sugar/calories. Nothing is better on a hot day than watermelon! It cools me down like nothing else. Raspberries, strawberries, apricots, nectarines, blackberries; how much room do I have to describe how much I appreciate the wonders of lusciousness God has provided? This is but a minor list of favs. My sister, Rosalie, introduced me to “soft-fruit” fruit salad years ago. Until then, we were accustomed to fruit that was available at Thanksgiving for the salad: apples, oranges, pears, etc. You can tell, I prefer the soft variety. Gorgeous photo of these red BERRIES! P.S. We have an apricot tree in the backyard. I just gathered a large amount; some to eat, some to wash, pit & freeze for breakfast smoothies. DELICIOUS! Mary Ann, I just ate but I get hungry again reading about all those lovely fruits. I do miss that about California. Jeff and I keep saying we need to try to grow a fruit tree here, but somehow it just wouldn’t be the same I’m afraid. Thanks for dropping by with your fruit basket – I hope to be chatting over smoothies with you someday when we finally do make it back out there to visit. Hey what is a vinegar wash? I assume I should just put some in the water I wash the berries with? Right now I have a spray bottle filled with a mixture of dish detergent and water; I spray the berries down, toss them a bit (gently) rinse, wash, soak (in soapy water) rinse, wash soak etc. until the water no longer looks dirty – which often takes awhile! But it’s worth it because I think the berries are sweeter if they’re VERY clean. Maybe vinegar would be good instead of (or in addition to) the soapy water? My mother tells me, when I was little and complained that I was hungry and there was nothing to eat, it usually meant we were out on fruits 🙂 A Great Post for fruit lovers!! Thank you! I tend to be the same way now. If there is no fruit in the house, I’m “stuck” with less healthy snacks. We are lucky to have such options available to us no matter the season. Thanks for being here, and for your comment! We are having a bumper crop of strawberries here; three bowlfuls already. They go great with Dreyers-Vanilla Bean ice cream, 210 calories a half a cup. I think the variety we have is “Rainier”. Also have some raspberries coming on. No blueberries yet, but snow peas are also coming in. There are lots of people recommending ice cream with strawberries; I may have to try it. I enjoy eating them plain so much that I figure I can cut out the ice cream altogether, but I do love berries on frozen yogurt, so maybe I’ll buy some of that to try. WOW, a bumper crop of fresh grown strawberries! Life is good, isn’t it? As I have mentioned before, there is no comparison between a real Washington Strawberry and the California pseudo berry of the same nomenclature. No comparison. Speaking of peaches, on one of my first trips to Atlanta to a conference at the Georgia Convention center, I took a bus out to the King Memorial center. On my way back- exhausted and hungry and near hangry- as I get hangry when I am hungry- I stopped at a little soul food diner on the bus route. I have no idea where this place might be. It was all cafeteria style. I had chicken and rice, greens, sweet tea and peach cobbler ala mode. The cobbler was just Divine and I have never had anything half as good. I was the only white person in this little eatery. Someday I will find it again, but in the meantime can you send me your cobbler recipe? Michael, was it the Busy Bee, by any chance? I imagine their cobbler is superb, but with Georgia peaches, you can’t go wrong. I used to think of Georgia as excelling in peaches, pecans and peanuts, all of which are mighty good locally. I will just have to try a Washington Strawberry and see how it compares to the CA and southern varieties. One more reason for us to try to get back to the northwest. RE: a cobbler, I was never famous for that particular dish, but I know how to make a very, very easy and cheap one. You can use canned or fresh fruit, depending on how desperate you are. Just melt a stick of butter in a large (2 quart) Corningware dish. Stir up 1 cup of flour, 1 cup of sugar (I would use less now) and 1 Tablespoon of baking powder with 2/3 cup of Milk. Then pour the batter into the melted butter in the dish and top with however much fruit you want – at least one BIG (double size) can of peaches or 4-5 sliced fresh peaches. You can sprinkle cinnamon and sugar on the top lightly if you want, but I never did this since Jeff doesn’t like cinnamon. Then bake it at 350 for about 40 minutes. The batter will rise up to the top and make a crust over the fruit. This is the easiest and cheapest dessert around. When Jeff was in dental school I would make this with canned peaches for practically nothing, cost-wise, and he would literally sometimes eat the entire thing by himself. We could eat like crazy in those years and never gain weight. Have not idea of the name of the place. I will have to look up the Busy Bee. Close to the King Memorial? That sounds like a very easy recipe which I will have to try. Michael says his pea plants are not doing that well, but the watermelon and cantaloupes are looking good. In the 90’s there in Atlanta now. I guess Northwest area is much better for cooler crops. I do best with Snow peas and lettuce, and the occasional tomato. Jan Karon has created a in idyllic little place hasn’t she? Reminds me somehow of Mayberry RFD. Makes me miss the little town we lived in – in Eastern Washington. Seems like a very safe place- Mittford. It sounds like a nice place to retire. I wonder what the real estate market is there now? Michael, I thought the Busy Bee looked like a good place to go – I haven’t been there but next time we are in Atlanta maybe we can give it a try since it’s close to where Drew and Megan live. Looks like they have my kind of food, good southern home cooking. Yes, I think the Northwest is a much more ideal climate for growing almost anything – I know the Central Coast was; the morning fog/mist that burned off into sunshine every day, year round, was something plants LOVED and I falsely thought I was good at gardening until we moved away from there! Mitford is a fictional place but Karon lived in Blowing Rock, NC while she wrote about Mitford – and yes, it reminds many of us of Mayberry. Jeff and I have often thought NC would be an ideal place to retire, although Karon herself now lives in the Blue Ridge mountain area of Virginia. I had a very interesting encounter with her personal generosity and have a lovely signed book from her that she sent me as a gift many years ago. It happened after I heard her at this lecture at the National Cathedral many years ago. If you have time to watch and listen to it, I highly recommend it — just click on the link and it will take you to cathedral’s archive where their lectures are freely available – Karon’s talk was quite enjoyable and she has some important things to say. Have you been to “Poor Folks” restaurant in ATL or Williamson Brother’s Barbecue? There used to be a chain called “Po Folks” that I loved, but I haven’t heard of either of those restaurants in Atlanta. We should look them up sometime while we are there. The cobbler does sound mighty good. It must be Po Folks. But have not found it in Atlanta yet. I think the chain went out of business decades ago; at least I haven’t seen one in that long. I liked it while it was open.